WAND is excited to launch the 2017 Dorset Women’s Week Programme! 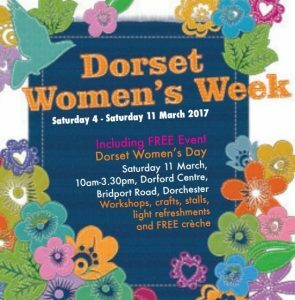 The week runs from 4-11 March and culminates again in Dorset Women’s Day. We have more fantastic events and opportunities this year during the week including a Guided Tour of Arne Nature Reserve, Feminine and Fabulous confidence building workshop, Well Women Yoga and free swimming and exercise classes at Oxley Leisure Centre. Dorset Women’s Day on Saturday 11 March, at the Dorford Centre has a wide range of exciting workshops including bike maintenance, flower arranging, assertiveness, African drumming, a ukulele crash course, ballet, and permaculture principles, to name just a few! We have some brilliant performances in the main hall throughout the day, along with stalls selling a range of products and information stands. See the Programme for more details. Our fabulous catering team will be on hand to sell drinks and delicious sandwiches and cakes. We also have our Rummage Room so come and have rummage and pick up some new to you. If you have anything you’d like to donate please bring it along on the day. A huge thank you to everyone who is giving up their time to run a workshop, perform, have a stall as well as the brilliant team behind the scenes making this a fabulous day. “It’s Dorset Women’s Day again, how fabulous! We meet once more ladies, in the wake of the most powerful women’s marches on the planet too. All across the world, the value of sisterhood was shaken up that day and continues to be fully realised. If you have any queries please email wanddorset@gmail.com or call WAND on 07379 426525. This entry was posted in Activity, Event and tagged Dorchester, Dorset, Dorset Women's Week, Women's Day on February 17, 2017 by mariac.